The Nifty Midcap Index is at a new high. And guess what, it’s P/E ratio is also at a new high. 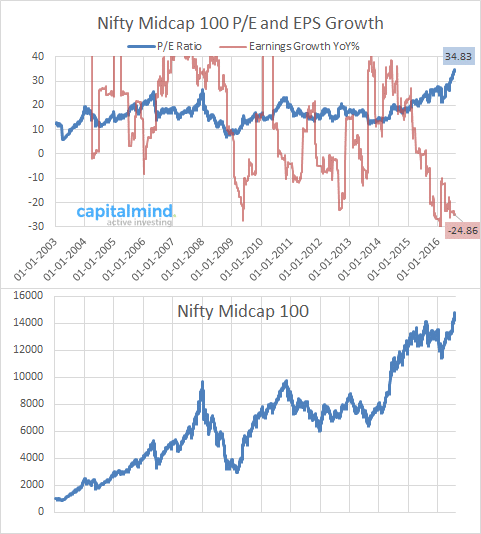 The highest ever Nifty Midcap P/E. And nearly the lowest ever earnings change over the previous year – at -25%. These are incredible times. We’re running on a lot of steam and huge expectations. Some midcaps have delivered, and justify their P/E but others hardly made the grade. We’ll know more in the next few weeks as other results come. Investing at such a time is much more risky if you’re not nimble enough or willing to go short. But midcaps seem to want to ignore all fundamentals and just keep going one way – up. Watch out for the madness!